Pee Wee Reese led the Dodgers to seven pennants between 1941 and 1956. Despite his small size (5'10", 160 pounds), he was the acknowledged leader on the star-laden club. 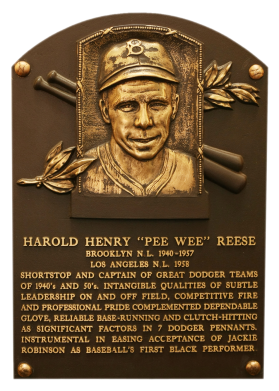 One of the top-fielding shortstops during the 1940s and 1950s, Pee Wee was an All-Star from 1947 to 1954. He scored 1,338 runs in his career, leading the NL in 1947 with 132. When Branch Rickey signed Jackie Robinson, it was Reese, a Southerner, who led his teammates to accept Robinson as a player and a friend. 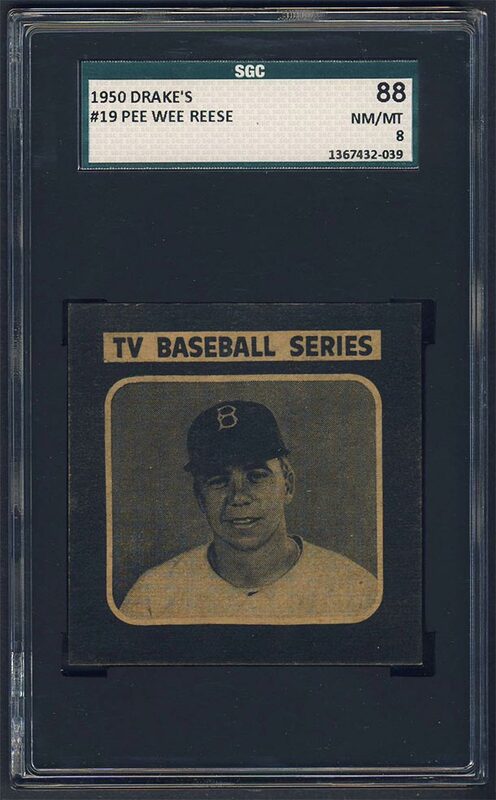 Comments: In April, 2001 I pulled the trigger on a beautiful PSA 8 1953 Topps card made available on eBay by 734. The card stayed in my collection for several years. I love the '53 set and also owned a Jackie Robinson PSA 8 as well as a PSA 7 Satchell Paige. 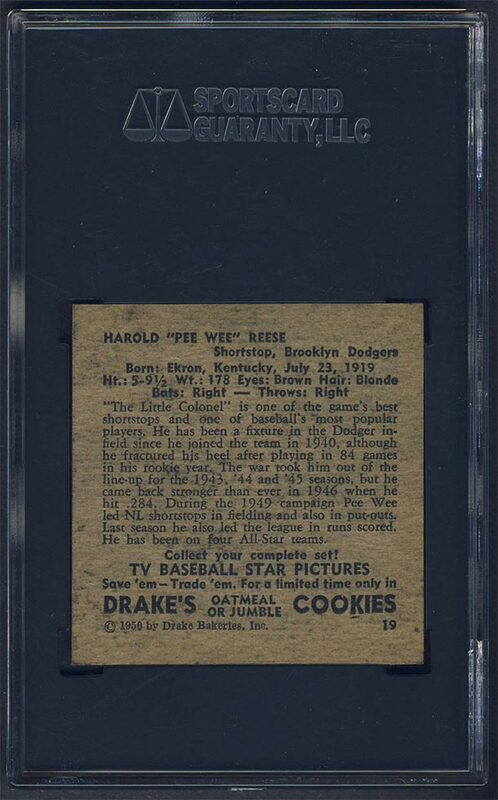 In order to diversify the collection a little more I swapped out the Reese for this 1950 Drakes PSA 7 in December, 2006 from 3178 when it showed up on the Net 54 B/S/T site. I couldn't pass it up. In 2011, I purchased a GAI 8.5 example but upon receipt realized the card was trimmed. The side-to-side and top-to-bottom measurements were approximately 1/16" shorter than my PSA 7. I'm still looking for an upgrade to my NM card but have come up short. UPDATE: On November 5th, 2015 I checked the Heritage Auctions website to review their latest offering. As I reviewed each lot, I ended up tracking 17 different lots ending later that evening including an N28 Comiskey SGC 84, a N43 Ewing PSA 6, an E90-2 Wagner PSA 6, a 1914 Cracker Jack Plank PSA 7, and a 1952 Topps Eddie Mathews SGC 84. All of these were potential upgrades for my collection, but not within the budget for this auction. Two other cards caught my eye – a 1935 Diamond Stars Hafey PSA 8 and a 1950 Drakes Reese SGC 88. I placed some bids in order to participate in the extended bidding frenzy. The Reese was centered significantly better than my PSA 7. I was outbid a couple times but in the end I won the card. I had my upgrade! Description: Entiltled "TV BaseballSeries," the 1950 Drake's Bakeries set pictures 36 different players on a television screen format. 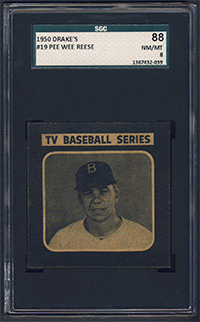 The cards, 2-1/2" X 2-1/2", contain black-and-white photos surrounded by a black border. 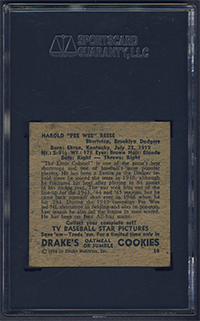 Backs carry a player biography plus an advertisement advising collectors to look for the cards in packages of Oatmeal or Jumble cookies.